Bending Machines : Tube Benders : Pipe Bender : J&S Machine, Inc.
What type of bending machine is right for me? 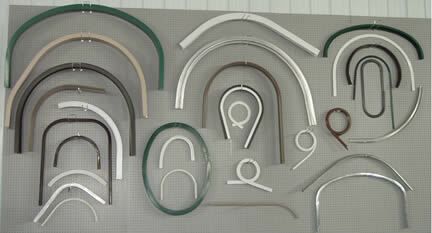 J&S Machine offers machines in three of these categories (stretch forming excluded). Rotary-draw bending machines are commonly used to bend mainly tube and pipe. In the case of our YLM rotary-draw bending machines, mandrels and wiper dies can be used to achieve very tight bends while maintaining a clean appearance. 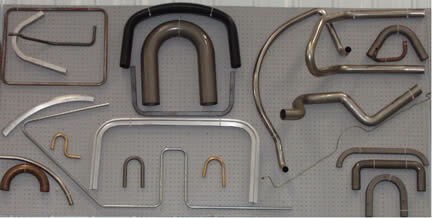 Tooling can be designed to make several bends, with minimal straight lengths between bends, on a multiple bending plane. Rotary-draw w/ Push-roll bending machines are perhaps the most versatile type of bending machine available. Many of the YLM CNC machines that we carry are capable of combining rotary-draw & roll formed bends in one operation. Compression bending machines are commonly used with heavy-wall material or material that is being bent to a radius >2.5 times the OD of the tube. In the case of our YLM double-head compression benders, tooling can be made to produce two bends, on multiple tubes, simultaneously. Roll forming machines are commonly used for bending angle iron, custom profiles, and coils. In the case of our TreC bending machines, custom rolls can be manufactured to fit most specialty profiles, and various attachments are available for bending angle iron & I-beam material. Many of the TreC machines that we carry are capable of producing multiple radius parts such as ovals in one operation. What type of material are you planning to bend? What shape is the material; Round, square, angle, custom extruded, etc.? What size is the material you will be bending? What are the desired radius/radii of the final product? What is the degree of bend(s)? Are you bending a single or multiple radius part? Are the bends all on the same bending plane? Are you looking to bend small quantities or hundreds of parts a day? Give us a call – we are here to assist you in the decision you will make.